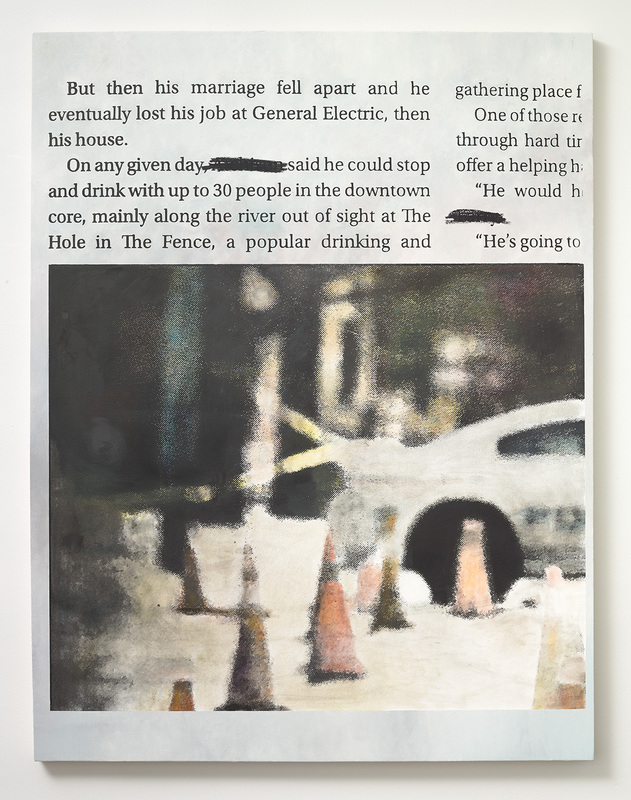 Alex Bierk, GE Story, 2018, screen print and oil on canvas, 66" x 51"
Alex Bierk, The Blue Road, 2018, oil on linen, 11" x 15"
Amongst the numerous fall season openings in Toronto are several noteworthy painting exhibitions. A highlight of these is Alex Bierk's Place at the End (General Hardware, Sept. 13 - Oct. 27). Bierk merges small text pieces, realist paintings (his father David's influence is visible here), and large-scale mixed media works for a journey of recollection, a conjuring of memories of addiction in a small city, a narrative that repeats itself across rural and suburban Canada yet for the most part remains unexplored in the white cube. His smaller watercolour and oil paintings, for example, The Blue Road (2018, oil on linen, 11" x 15"), weave throughout the gallery. Trippy, druggie flashbacks, these works range from depictions of spilled over pill bottles, to birds in flight, to country road signs. Their non-linear, almost scattered installation and varied imagery along with bleak texts of lost jobs and methadone recovery mimic the frenetic, fragmented life of addiction but at the same time cohere around that theme. Anti-cinematic with its low-key, unpretentious but masterful vignettes, this addiction narrative gains strength from being as far removed from Hollywood drug culture romanticization as its Peterborough setting. A dramatic switch from small-town dystopia to Edenic landscapes framed by Modernist architecture, an exhibition by Alliston, Ontario-based Gary Evans (Open Storage at Paul Petro Contemporary Art, Sept. 7 - Oct. 6) forms an exercise in opposites with Bierk's. Evans, an unwavering painterly painter, does not disappoint with his carnivalesque line and colour. For contrast, he backs this levity with a Baroque-like underscore of darker tones. 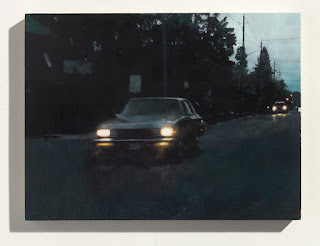 Birch Contemporary continues painter's painting in concurrent exhibitions by Martin Golland and Howard Lonn (Vignettes and Aggregates and Terminal AF respectively, both running from Sept. 6 to Oct. 13). Lonn's Their Ashes (2018) stands out as iconic for its depiction of a ferris wheel (based on a photo of the Reissenrad ferris wheel in Vienna) as viewed through what appears to be a CGI screen of snow but is actually a careful layering and revealment of paint. This juxtaposition of winter bleakness in the foreground and childhood joy in the background merges to strike a fine balance between melancholy and nostalgia. Like Lonn, Sky Glabush is an artist worth watching. His most recent exhibition of Klee-influenced figures, florals, and architecturals (The Valley of Love, Clint Roenisch, Sept. 7 - Oct. 20), however, underwhelms with its muted oil colours and forced faux-naif painting. A style shapeshifter who has morphed from realism to abstraction, and who now exhibits in the reigning figurative mode, Glabush never quite settles on what matters to him. Bierk, on the other hand, stays fixed on his addiction recovery. Riveted, we navigate back with him through the haze of highs and bottomless cravings.